For over 30 years, bone marrow has been used to treat people with cancer with conditions such as leukaemia and lymphoma; this is the only form of stem-cell therapy that is widely practiced. During chemotherapy, most growing cells are killed by the cytotoxic agents. These agents, however, cannot discriminate between the leukaemia or neoplastic cells, and the hematopoietic stem cells within the bone marrow. It is this side effect of conventional chemotherapy strategies that the stem-cell transplant attempts to reverse; a donor's healthy bone marrow reintroduces functional stem cells to replace the cells lost in the host's body during treatment. The transplanted cells also generate an immune response that helps to kill off the cancer cells; this process can go too far, however, leading to graft vs host disease, the most serious side effect of this treatment. Another stem-cell therapy called Prochymal, was conditionally approved in Canada in 2012 for the management of acute graft-vs-host disease in children who are unresponsive to steroids. It is an allogenic stem therapy based on mesenchymal stem cells (MSCs) derived from the bone marrow of adult donors. MSCs are purified from the marrow, cultured and packaged, with up to 10,000 doses derived from a single donor. The doses are stored frozen until needed. The FDA has approved five hematopoietic stem-cell products derived from umbilical cord blood, for the treatment of blood and immunological diseases. In 2014, the European Medicines Agency recommended approval of limbal stem cells for people with severe limbal stem cell deficiency due to burns in the eye. Diseases and conditions where stem cell treatment is promising or emerging. Stem cells are being studied for a number of reasons. The molecules and exosomes released from stem cells are also being studied in an effort to make medications. In addition to the functions of the cells themselves, paracrine soluble factors produced by stem cells, known as the stem cell secretome, has been found to be another mechanism by which stem cell-based therapies mediate their effects in degenerative, auto-immune and inflammatory diseases. Research has been conducted on the effects of stem cells on animal models of brain degeneration, such as in Parkinson's, Amyotrophic lateral sclerosis, and Alzheimer's disease. 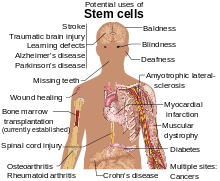 There have been preliminary studies related to multiple sclerosis. Healthy adult brains contain neural stem cells which divide to maintain general stem-cell numbers, or become progenitor cells. In healthy adult laboratory animals, progenitor cells migrate within the brain and function primarily to maintain neuron populations for olfaction (the sense of smell). Pharmacological activation of endogenous neural stem cells has been reported to induce neuroprotection and behavioral recovery in adult rat models of neurological disorder. Stroke and traumatic brain injury lead to cell death, characterized by a loss of neurons and oligodendrocytes within the brain. Clinical and animal studies have been conducted into the use of stem cells in cases of spinal cord injury. Stem cells are studied in people with severe heart disease. The work by Bodo-Eckehard Strauer was discredited by identifying hundreds of factual contradictions. Among several clinical trials reporting that adult stem cell therapy is safe and effective, actual evidence of benefit has been reported from only a few studies. Some preliminary clinical trials achieved only modest improvements in heart function following use of bone marrow stem cell therapy. Stem-cell therapy for treatment of myocardial infarction usually makes use of autologous bone marrow stem cells, but other types of adult stem cells may be used, such as adipose-derived stem cells. In 2013, studies of autologous bone marrow stem cells on ventricular function were found to contain "hundreds" of discrepancies. Critics report that of 48 reports there seemed to be just five underlying trials, and that in many cases whether they were randomized or merely observational accepter-versus-rejecter, was contradictory between reports of the same trial. One pair of reports of identical baseline characteristics and final results, was presented in two publications as, respectively, a 578 patient randomized trial and as a 391 subject observational study. Other reports required (impossible) negative standard deviations in subsets of people, or contained fractional subjects, negative NYHA classes. Overall there were many more people published as having receiving stem cells in trials, than the number of stem cells processed in the hospital's laboratory during that time. A university investigation, closed in 2012 without reporting, was reopened in July 2013. In 2014, a meta-analysis on stem cell therapy using bone marrow stem cells for heart disease revealed discrepancies in published clinical trial reports, whereby studies with a higher number of discrepancies showed an increase in effect sizes. Another meta-analysis based on the intra-subject data of 12 randomized trials was unable to find any significant benefits of stem cell therapy on primary endpoints, such as major adverse events or increase in heart function measures, concluding there was no benefit. The TIME trial, which used a randomized, double blind, placebo-controlled trial design, concluded that "bone marrow mononuclear cells administration did not improve recovery of LV function over 2 years" in people who had a myocardial infarction. Accordingly, the BOOST-2 trial conducted in 10 medical centers in Germany and Norway reported that the trial result "does not support the use of nucleated BMCs in patients with STEMI and moderately reduced LVEF". Furthermore, the trial also did not meet any other secondary MRI endpoints, leading to a conclusion that intracoronary bone marrow stem cell therapy does not offer a functional or clinical benefit. The specificity of the human immune-cell repertoire is what allows the human body to defend itself from rapidly adapting antigens. However, the immune system is vulnerable to degradation upon the pathogenesis of disease, and because of the critical role that it plays in overall defense, its degradation is often fatal to the organism as a whole. Diseases of hematopoietic cells are diagnosed and classified via a subspecialty of pathology known as hematopathology. The specificity of the immune cells is what allows recognition of foreign antigens, causing further challenges in the treatment of immune disease. Identical matches between donor and recipient must be made for successful transplantation treatments, but matches are uncommon, even between first-degree relatives. Research using both hematopoietic adult stem cells and embryonic stem cells has provided insight into the possible mechanisms and methods of treatment for many of these ailments. Fully mature human red blood cells may be generated ex vivo by hematopoietic stem cells (HSCs), which are precursors of red blood cells. In this process, HSCs are grown together with stromal cells, creating an environment that mimics the conditions of bone marrow, the natural site of red-blood-cell growth. Erythropoietin, a growth factor, is added, coaxing the stem cells to complete terminal differentiation into red blood cells. Further research into this technique should have potential benefits to gene therapy, blood transfusion, and topical medicine. In 2004, scientists at King's College London discovered a way to cultivate a complete tooth in mice and were able to grow bioengineered teeth stand-alone in the laboratory. Researchers are confident that the tooth regeneration technology can be used to grow live teeth in people. In theory, stem cells taken from the patient could be coaxed in the lab turning into a tooth bud which, when implanted in the gums, will give rise to a new tooth, and would be expected to be grown in a time over three weeks. It will fuse with the jawbone and release chemicals that encourage nerves and blood vessels to connect with it. The process is similar to what happens when humans grow their original adult teeth. Many challenges remain, however, before stem cells could be a choice for the replacement of missing teeth in the future. Heller has reported success in re-growing cochlea hair cells with the use of embryonic stem cells. Since 2003, researchers have successfully transplanted corneal stem cells into damaged eyes to restore vision. "Sheets of retinal cells used by the team are harvested from aborted fetuses, which some people find objectionable." When these sheets are transplanted over the damaged cornea, the stem cells stimulate renewed repair, eventually restore vision. The latest such development was in June 2005, when researchers at the Queen Victoria Hospital of Sussex, England were able to restore the sight of forty people using the same technique. The group, led by Sheraz Daya, was able to successfully use adult stem cells obtained from the patient, a relative, or even a cadaver. Further rounds of trials are ongoing. People with Type 1 diabetes lose the function of insulin-producing beta cells within the pancreas. In recent experiments, scientists have been able to coax embryonic stem cell to turn into beta cells in the lab. In theory if the beta cell is transplanted successfully, they will be able to replace malfunctioning ones in a diabetic patient. Use of mesenchymal stem cells (MSCs) derived from adult stem cells is under preliminary research for potential orthopedic applications in bone and muscle trauma, cartilage repair, osteoarthritis, intervertebral disc surgery, rotator cuff surgery, and musculoskeletal disorders, among others. Other areas of orthopedic research for uses of MSCs include tissue engineering and regenerative medicine. Stem cells can also be used to stimulate the growth of human tissues. In an adult, wounded tissue is most often replaced by scar tissue, which is characterized in the skin by disorganized collagen structure, loss of hair follicles and irregular vascular structure. In the case of wounded fetal tissue, however, wounded tissue is replaced with normal tissue through the activity of stem cells. A possible method for tissue regeneration in adults is to place adult stem cell "seeds" inside a tissue bed "soil" in a wound bed and allow the stem cells to stimulate differentiation in the tissue bed cells. This method elicits a regenerative response more similar to fetal wound-healing than adult scar tissue formation. Researchers are still investigating different aspects of the "soil" tissue that are conducive to regeneration. Because of the general healing capabilities of stem cells, they have gained interest for the treatment of cutaneous wounds, such as in skin cancer. Culture of human embryonic stem cells in mitotically inactivated porcine ovarian fibroblasts (POF) causes differentiation into germ cells (precursor cells of oocytes and spermatozoa), as evidenced by gene expression analysis. Human embryonic stem cells have been stimulated to form Spermatozoon-like cells, yet still slightly damaged or malformed. It could potentially treat azoospermia. In 2012, oogonial stem cells were isolated from adult mouse and human ovaries and demonstrated to be capable of forming mature oocytes. These cells have the potential to treat infertility. Destruction of the immune system by the HIV is driven by the loss of CD4+ T cells in the peripheral blood and lymphoid tissues. Viral entry into CD4+ cells is mediated by the interaction with a cellular chemokine receptor, the most common of which are CCR5 and CXCR4. Because subsequent viral replication requires cellular gene expression processes, activated CD4+ cells are the primary targets of productive HIV infection. Recently scientists have been investigating an alternative approach to treating HIV-1/AIDS, based on the creation of a disease-resistant immune system through transplantation of autologous, gene-modified (HIV-1-resistant) hematopoietic stem and progenitor cells (GM-HSPC). Stem cells are thought to mediate repair via five primary mechanisms: 1) providing an anti-inflammatory effect, 2) homing to damaged tissues and recruiting other cells, such as endothelial progenitor cells, that are necessary for tissue growth, 3) supporting tissue remodeling over scar formation, 4) inhibiting apoptosis, and 5) differentiating into bone, cartilage, tendon, and ligament tissue. To further enrich blood supply to the damaged areas, and consequently promote tissue regeneration, platelet-rich plasma could be used in conjunction with stem cell transplantation. The efficacy of some stem cell populations may also be affected by the method of delivery; for instance, to regenerate bone, stem cells are often introduced in a scaffold where they produce the minerals necessary for generation of functional bone. Stem cells have also been shown to have a low immunogenicity due to the relatively low number of MHC molecules found on their surface. In addition, they have been found to secrete chemokines that alter the immune response and promote tolerance of the new tissue. This allows for allogeneic treatments to be performed without a high rejection risk. The ability to grow up functional adult tissues indefinitely in culture through Directed differentiation creates new opportunities for drug research. Researchers are able to grow up differentiated cell lines and then test new drugs on each cell type to examine possible interactions in vitro before performing in vivo studies. This is critical in the development of drugs for use in veterinary research because of the possibilities of species specific interactions. The hope is that having these cell lines available for research use will reduce the need for research animals used because effects on human tissue in vitro will provide insight not normally known before the animal testing phase. With the advent of induced pluripotent stem cells (iPSC), treatments being explored and created for the used in endangered low production animals possible. Rather than needing to harvest embryos or eggs, which are limited, the researchers can remove mesenchymal stem cells with greater ease and greatly reducing the danger to the animal due to noninvasive techniques. This allows the limited eggs to be put to use for reproductive purposes only. Stem cells are being explored for use in conservation efforts. Spermatogonial stem cells have been harvested from a rat and placed into a mouse host and fully mature sperm were produced with the ability to produce viable offspring. Currently research is underway to find suitable hosts for the introduction of donor spermatogonial stem cells. If this becomes a viable option for conservationists, sperm can be produced from high genetic quality individuals who die before reaching sexual maturity, preserving a line that would otherwise be lost. Most stem cells intended for regenerative therapy are generally isolated either from the patient's bone marrow or from adipose tissue. Mesenchymal stem cells can differentiate into the cells that make up bone, cartilage, tendons, and ligaments, as well as muscle, neural and other progenitor tissues, they have been the main type of stem cells studied in the treatment of diseases affecting these tissues. The number of stem cells transplanted into damaged tissue may alter efficacy of treatment. Accordingly, stem cells derived from bone marrow aspirates, for instance, are cultured in specialized laboratories for expansion to millions of cells. Although adipose-derived tissue also requires processing prior to use, the culturing methodology for adipose-derived stem cells is not as extensive as that for bone marrow-derived cells. While it is thought that bone-marrow derived stem cells are preferred for bone, cartilage, ligament, and tendon repair, others believe that the less challenging collection techniques and the multi-cellular microenvironment already present in adipose-derived stem cell fractions make the latter the preferred source for autologous transplantation. New sources of mesenchymal stem cells are being researched, including stem cells present in the skin and dermis which are of interest because of the ease at which they can be harvested with minimal risk to the animal. Hematopoetic stem cells have also been discovered to be travelling in the blood stream and possess equal differentiating ability as other mesenchymal stem cells, again with a very non-invasive harvesting technique. There has been more recent interest in the use of extra embryonic mesenchymal stem cells. Research is underway to examine the differentiating capabilities of stem cells found in the umbilical cord, yolk sac and placenta of different animals. These stem cells are thought to have more differentiating ability than their adult counterparts, including the ability to more readily form tissues of endodermal and ectodermal origin. There is widespread controversy over the use of human embryonic stem cells. This controversy primarily targets the techniques used to derive new embryonic stem cell lines, which often requires the destruction of the blastocyst. Opposition to the use of human embryonic stem cells in research is often based on philosophical, moral, or religious objections. There is other stem cell research that does not involve the destruction of a human embryo, and such research involves adult stem cells, amniotic stem cells, and induced pluripotent stem cells. On 23 January 2009, the US Food and Drug Administration gave clearance to Geron Corporation for the initiation of the first clinical trial of an embryonic stem-cell-based therapy on humans. The trial aimed evaluate the drug GRNOPC1, embryonic stem cell-derived oligodendrocyte progenitor cells, on people with acute spinal cord injury. The trial was discontinued in November 2011 so that the company could focus on therapies in the "current environment of capital scarcity and uncertain economic conditions". In 2013 biotechnology and regenerative medicine company BioTime (AMEX: BTX) acquired Geron's stem cell assets in a stock transaction, with the aim of restarting the clinical trial. Scientists have reported that MSCs when transfused immediately within few hours post thawing may show reduced function or show decreased efficacy in treating diseases as compared to those MSCs which are in log phase of cell growth(fresh), so cryopreserved MSCs should be brought back into log phase of cell growth in invitro culture before these are administered for clinical trials or experimental therapies, re-culturing of MSCs will help in recovering from the shock the cells get during freezing and thawing. Various clinical trials on MSCs have failed which used cryopreserved product immediately post thaw as compared to those clinical trials which used fresh MSCs. Research has been conducted on horses, dogs, and cats can benefit the development of stem cell treatments in veterinary medicine and can target a wide range of injuries and diseases such as myocardial infarction, stroke, tendon and ligament damage, osteoarthritis, osteochondrosis and muscular dystrophy both in large animals, as well as humans. While investigation of cell-based therapeutics generally reflects human medical needs, the high degree of frequency and severity of certain injuries in racehorses has put veterinary medicine at the forefront of this novel regenerative approach. Companion animals can serve as clinically relevant models that closely mimic human disease. Veterinary applications of stem cell therapy as a means of tissue regeneration have been largely shaped by research that began with the use of adult-derived mesenchymal stem cells to treat animals with injuries or defects affecting bone, cartilage, ligaments and/or tendons. There are two main categories of stem cells used for treatments: allogeneic stem cells derived from a genetically different donor within the same species and autologous mesenchymal stem cells, derived from the patient prior to use in various treatments. A third category, xenogenic stem cells, or stem cells derived from different species, are used primarily for research purposes, especially for human treatments. Bone has a unique and well documented natural healing process that normally is sufficient to repair fractures and other common injuries. Misaligned breaks due to severe trauma, as well as treatments like tumor resections of bone cancer, are prone to improper healing if left to the natural process alone. Scaffolds composed of natural and artificial components are seeded with mesenchymal stem cells and placed in the defect. Within four weeks of placing the scaffold, newly formed bone begins to integrate with the old bone and within 32 weeks, full union is achieved. Further studies are necessary to fully characterize the use of cell-based therapeutics for treatment of bone fractures. Stem cells have been used to treat degenerative bone diseases. The normally recommended treatment for dogs that have Legg–Calve–Perthes disease is to remove the head of the femur after the degeneration has progressed. Recently, mesenchymal stem cells have been injected directly in to the head of the femur, with success not only in bone regeneration, but also in pain reduction. Autologous stem cell-based treatments for ligament injury, tendon injury, osteoarthritis, osteochondrosis, and sub-chondral bone cysts have been commercially available to practicing veterinarians to treat horses since 2003 in the United States and since 2006 in the United Kingdom. Autologous stem cell based treatments for tendon injury, ligament injury, and osteoarthritis in dogs have been available to veterinarians in the United States since 2005. Over 3000 privately owned horses and dogs have been treated with autologous adipose-derived stem cells. The efficacy of these treatments has been shown in double-blind clinical trials for dogs with osteoarthritis of the hip and elbow and horses with tendon damage. Race horses are especially prone to injuries of the tendon and ligaments. Conventional therapies are very unsuccessful in returning the horse to full functioning potential. Natural healing, guided by the conventional treatments, leads to the formation of fibrous scar tissue that reduces flexibility and full joint movement. Traditional treatments prevented a large number of horses from returning to full activity and also have a high incidence of re-injury due to the stiff nature of the scarred tendon. Introduction of both bone marrow and adipose derived stem cells, along with natural mechanical stimulus promoted the regeneration of tendon tissue. The natural movement promoted the alignment of the new fibers and tendocytes with the natural alignment found in uninjured tendons. Stem cell treatment not only allowed more horses to return to full duty and also greatly reduced the re-injury rate over a three-year period. The use of embryonic stem cells has also been applied to tendon repair. The embryonic stem cells were shown to have a better survival rate in the tendon as well as better migrating capabilities to reach all areas of damaged tendon. The overall repair quality was also higher, with better tendon architecture and collagen formed. There was also no tumor formation seen during the three-month experimental period. Long-term studies need to be carried out to examine the long-term efficacy and risks associated with the use of embryonic stem cells. Similar results have been found in small animals. Osteoarthritis is the main cause of joint pain both in animals and humans. Horses and dogs are most frequently affected by arthritis. Natural cartilage regeneration is very limited. Different types of mesenchymal stem cells and other additives are still being researched to find the best type of cell and method for long-term treatment. Adipose-derived mesenchymal cells are currently the most often used for stem cell treatment of osteoarthritis because of the non-invasive harvesting. This is a recently developed, non-invasive technique developed for easier clinical use. Dogs receiving this treatment showed greater flexibility in their joints and less pain. Stem cells have successfully been used to ameliorate healing in the heart after myocardial infarction in dogs. Adipose and bone marrow derived stem cells were removed and induced to a cardiac cell fate before being injected into the heart. The heart was found to have improved contractility and a reduction in the damaged area four weeks after the stem cells were applied. A different trial is underway for a patch made of a porous substance onto which the stem cells are "seeded" in order to induce tissue regeneration in heart defects. Tissue was regenerated and the patch was well incorporated into the heart tissue. This is thought to be due, in part, to improved angiogenesis and reduction of inflammation. Although cardiomyocytes were produced from the mesenchymal stem cells, they did not appear to be contractile. Other treatments that induced a cardiac fate in the cells before transplanting had greater success at creating contractile heart tissue. Spinal cord injuries are one of the most common traumas brought into veterinary hospitals. Spinal injuries occur in two ways after the trauma: the primary mechanical damage, and in secondary processes, like inflammation and scar formation, in the days following the trauma. These cells involved in the secondary damage response secrete factors that promote scar formation and inhibit cellular regeneration. Mesenchymal stem cells that are induced to a neural cell fate are loaded onto a porous scaffold and are then implanted at the site of injury. The cells and scaffold secrete factors that counteract those secreted by scar forming cells and promote neural regeneration. Eight weeks later, dogs treated with stem cells showed immense improvement over those treated with conventional therapies. Dogs treated with stem cells were able to occasionally support their own weight, which has not been seen in dogs undergoing conventional therapies. Treatments are also in clinical trials to repair and regenerate peripheral nerves. Peripheral nerves are more likely to be damaged, but the effects of the damage are not as widespread as seen in injuries to the spinal cord. Treatments are currently in clinical trials to repair severed nerves, with early success. Stem cells induced to a neural fate injected in to a severed nerve. Within four weeks, regeneration of previously damaged stem cells and completely formed nerve bundles were observed. Stem cells are also in clinical phases for treatment in ophthalmology. Hematopoietic stem cells have been used to treat corneal ulcers of different origin of several horses. These ulcers were resistant to conventional treatments available, but quickly responded positively to the stem cell treatment. Stem cells were also able to restore sight in one eye of a horse with retinal detachment, allowing the horse to return to daily activities. In the late 1990s and early 2000s, there was an initial wave of companies and clinics offering stem cell therapy, while not substantiating health claims or having regulatory approval. By 2012, a second wave of companies and clinics had emerged, usually located in developing countries where medicine is less regulated and offering stem cell therapies on a medical tourism model. Like the first wave companies and clinics, they made similar strong, but unsubstantiated, claims, mainly by clinics in the United States, Mexico, Thailand, India, and South Africa. In 2018, the FDA sent a warning letter to StemGenex Biologic Laboratories in San Diego, which marketed a service in which it took body fat from people, processed it into mixtures it said contained various forms of stem cells, and administered it back to the person by inhalation, intravenously, or infusion into their spinal cords; the company said the treatment was useful for many chronic and life-threatening conditions. In 2018, the US Federal Trade Commission found health centers and an individual physician making unsubstantiated claims for stem cell therapies, and forced refunds of some $500,000. ^ Karanes C, Nelson GO, Chitphakdithai P, Agura E, Ballen KK, Bolan CD, Porter DL, Uberti JP, King RJ, Confer DL (2008). "Twenty years of unrelated donor hematopoietic cell transplantation for adult recipients facilitated by the National Marrow Donor Program". Biology of Blood and Marrow Transplantation. 14 (9 Suppl): 8–15. doi:10.1016/j.bbmt.2008.06.006. PMID 18721775. ^ Malard F, Mohty M (2014). "New Insight for the Diagnosis of Gastrointestinal Acute Graft-versus-Host Disease". Mediators Inflamm. 2014: 701013. doi:10.1155/2014/701013. PMC 3964897. PMID 24733964. ^ "Prochymal – First Stem Cell Drug Approved". 22 May 2012. ^ "A Stem-Cell-Based Drug Gets Approval in Canada". 17 May 2012. ^ Rosemann A (December 2014). "Why regenerative stem cell medicine progresses slower than expected". J Cell Biochem. 115 (12): 2073–76. doi:10.1002/jcb.24894. PMID 25079695. ^ European Medicines Agency. "First stem-cell therapy recommended for approval in EU". Retrieved 12 December 2014. ^ Maguire, G (12 May 2016). "Therapeutics from Adult Stem Cells and the Hype Curve". ACS Medicinal Chemistry Letters. 7 (5): 441–43. doi:10.1021/acsmedchemlett.6b00125. PMC 4867479. PMID 27190588. ^ Teixeira, Fábio G.; Carvalho, Miguel M.; Sousa, Nuno; Salgado, António J. (1 October 2013). "Mesenchymal stem cells secretome: a new paradigm for central nervous system regeneration?". Cellular and Molecular Life Sciences. 70 (20): 3871–3882. doi:10.1007/s00018-013-1290-8. ISSN 1420-682X. PMID 23456256. ^ Vastag B (April 2001). "Stem cells step closer to the clinic: paralysis partially reversed in rats with ALS-like disease". JAMA. 285 (13): 1691–93. doi:10.1001/jama.285.13.1691. PMID 11277806. ^ Rebeiro P, Moore J (2016). "The role of autologous haemopoietic stem cell transplantation in the treatment of autoimmune disorders". Intern Med J. 46 (1): 17–28. doi:10.1111/imj.12944. PMID 26524106. ^ "Results Reported from Case Studies of Stem Cell Transplantation in People with Relapsing and Progressive MS". National MS Society. January 2015. ^ Androutsellis-Theotokis A, Leker RR, Soldner F, et al. (August 2006). "Notch signalling regulates stem cell numbers in vitro and in vivo". Nature. 442 (7104): 823–26. doi:10.1038/nature04940. PMID 16799564. ^ Androutsellis-Theotokis A, Rueger MA, Park DM, et al. (August 2009). "Targeting neural precursors in the adult brain rescues injured dopamine neurons". Proc. Natl. Acad. Sci. U.S.A. 106 (32): 13570–75. doi:10.1073/pnas.0905125106. PMC 2714762. PMID 19628689. ^ Androutsellis-Theotokis A, Rueger MA, Mkhikian H, Korb E, McKay RD (2008). "Signaling pathways controlling neural stem cells slow progressive brain disease". Cold Spring Harb. Symp. Quant. Biol. 73: 403–10. doi:10.1101/sqb.2008.73.018. PMID 19022746. ^ Kang KS, Kim SW, Oh YH, et al. (2005). "A 37-year-old spinal cord-injured female patient, transplanted of multipotent stem cells from human UC blood, with improved sensory perception and mobility, both functionally and morphologically: a case study". Cytotherapy. 7 (4): 368–73. doi:10.1080/14653240500238160. PMID 16162459. ^ Cummings BJ, Uchida N, Tamaki SJ, et al. (September 2005). "Human neural stem cells differentiate and promote locomotor recovery in spinal cord-injured mice". Proc. Natl. Acad. Sci. U.S.A. 102 (39): 14069–74. doi:10.1073/pnas.0507063102. PMC 1216836. PMID 16172374. ^ Ptaszek LM, Mansour M, Ruskin JN, Chien KR (2012). "Towards regenerative therapy for cardiac disease". The Lancet. 379 (9819): 933–42. doi:10.1016/s0140-6736(12)60075-0. PMID 22405796. ^ Strauer, Bodo; Steinhoff G (September 2011). "10 years of intracoronary and intramyocardial bone marrow stem cell therapy of the heart: from the methodological origin to clinical practice". J Am Coll Cardiol. 58 (11): 1095–1104. doi:10.1016/j.jacc.2011.06.016. PMID 21884944. ^ Francis, DP; Mielewczik, M; Zargaran, D; Cole, GD (26 June 2013). "Autologous bone marrow-derived stem cell therapy in heart disease: Discrepancies and contradictions". International Journal of Cardiology. 168 (4): 3381–403. doi:10.1016/j.ijcard.2013.04.152. PMID 23830344. Archived from the original on 21 July 2013. Retrieved 21 July 2013. ^ Schannwell CM, Kostering M, Zeus T, Brehm M, Erdmann G, Fleissner T, Yosef M, Kogler G, Wernet P, Strauer BE (2008). "Humane autologe Stammzelltransplantation zur Myokardregeneration bei dilatativer Kardiomyopathie (NYHA Stadium II bis III)" (PDF). Austrian Journal of Cardiology. 15 (1): 23–30. ^ Kuswardhani R. A.; Soejitno A. (2011). "Bone marrow-derived stem cells as an adjunctive treatment for acute myocardial infarction: a systematic review and meta-analysis". Acta Medica Indonesiana. 43 (3): 168–77. PMID 21979282. ^ Malliaras K.; Kreke M.; Marban E. (2011). "The stuttering progress of cell therapy for heart disease". Clinical Pharmacology and Therapeutics. 90 (4): 532–41. doi:10.1038/clpt.2011.175. PMID 21900888. ^ Paul A.; Srivastava S.; Chen G.; Shum-Tim D.; Prakash S. (2011). "Functional Assessment of Adipose Stem Cells for Xenotransplantation Using Myocardial Infarction Immunocompetent Models: Comparison with Bone Marrow Stem Cells". Cell Biochemistry and Biophysics. 67 (2): 263–73. doi:10.1007/s12013-011-9323-0. PMID 22205499. ^ Francis, Darrel P (October 2013). "Autologous bone marrow-derived stem cell therapy in heart disease: Discrepancies and contradictions". Int J Cardiol. 168 (4): 3381–403. doi:10.1016/j.ijcard.2013.04.152. PMID 23830344. ^ Berndt, Christina (4 July 2013). "A minefield of contradictions". Sueddeutsche.de. Suddeutsche Zeitung. Retrieved 6 July 2013. ^ Nowbar, Alexandra N.; Mielewczik, Michael; Karavassilis, Maria; Dehbi, Hakim-Moulay; Shun-Shin, Matthew J.; Jones, Siana; Howard, James P.; Cole, Graham D.; Francis, Darrel P. (28 April 2014). "Discrepancies in autologous bone marrow stem cell trials and enhancement of ejection fraction (DAMASCENE): weighted regression and meta-analysis". BMJ. 348: g2688. doi:10.1136/bmj.g2688. ISSN 1756-1833. PMC 4002982. PMID 24778175. ^ Gyöngyösi, Mariann; Wojakowski, Wojciech; Lemarchand, Patricia; Lunde, Ketil; Tendera, Michal; Bartunek, Jozef; Marban, Eduardo; Assmus, Birgit; Henry, Timothy D.; Traverse, Jay H.; Moyé, Lemuel A.; Sürder, Daniel; Corti, Roberto; Huikuri, Heikki; Miettinen, Johanna; Wöhrle, Jochen; Obradovic, Slobodan; Roncalli, Jérome; Malliaras, Konstantinos; Pokushalov, Evgeny; Romanov, Alexander; Kastrup, Jens; Bergmann, Martin W.; Atsma, Douwe E.; Diederichsen, Axel; Edes, Istvan; Benedek, Imre; Benedek, Theodora; Pejkov, Hristo; Nyolczas, Noemi; Pavo, Noemi; Bergler-Klein, Jutta; Pavo, Imre J.; Sylven, Christer; Berti, Sergio; Navarese, Eliano P.; Maurer, Gerald (10 April 2015). "Meta-Analysis of Cell-based CaRdiac stUdiEs (ACCRUE) in Patients With Acute Myocardial Infarction Based on Individual Patient DataNovelty and Significance". Circulation Research. 116 (8): 1346–1360. doi:10.1161/CIRCRESAHA.116.304346. ISSN 0009-7330. PMC 4509791. PMID 25700037. ^ Traverse, Jay H.; Henry, Timothy D.; Pepine, Carl J.; Willerson, James T.; Chugh, Atul; Yang, Phillip C.; Zhao, David X.M. ; Ellis, Stephen G.; Forder, John R.; Perin, Emerson C.; Penn, Marc S.; Hatzopoulos, Antonis K.; Chambers, Jeffrey C.; Baran, Kenneth W.; Raveendran, Ganesh; Gee, Adrian P.; Taylor, Doris A.; Moyé, Lem; Ebert, Ray F.; Simari, Robert D. (2 February 2018). "TIME Trial: Effect of Timing of Stem Cell Delivery Following ST-Elevation Myocardial Infarction on the Recovery of Global and Regional Left Ventricular FunctionNovelty and Significance". Circulation Research. 122 (3): 479–488. doi:10.1161/CIRCRESAHA.117.311466. PMC 5805626. PMID 29208679. ^ Wollert, Kai C; Meyer, Gerd P; Müller-Ehmsen, Jochen; Tschöpe, Carsten; Bonarjee, Vernon; Larsen, Alf Inge; May, Andreas E; Empen, Klaus; Chorianopoulos, Emmanuel; Tebbe, Ulrich; Waltenberger, Johannes; Mahrholdt, Heiko; Ritter, Benedikta; Pirr, Jens; Fischer, Dieter; Korf-Klingebiel, Mortimer; Arseniev, Lubomir; Heuft, Hans-Gert; Brinchmann, Jan E; Messinger, Diethelm; Hertenstein, Bernd; Ganser, Arnold; Katus, Hugo A; Felix, Stephan B; Gawaz, Meinrad P; Dickstein, Kenneth; Schultheiss, Heinz-Peter; Ladage, Dennis; Greulich, Simon; Bauersachs, Johann (14 October 2017). "Intracoronary autologous bone marrow cell transfer after myocardial infarction: the BOOST-2 randomised placebo-controlled clinical trial". European Heart Journal. 38 (39): 2936–2943. doi:10.1093/eurheartj/ehx188. PMID 28431003. ^ Bartunek, Jozef; Wojakowski, Wojtek (14 October 2017). "Intracoronary autologous bone marrow cell transfer after acute myocardial infarction: abort and refocus". European Heart Journal. 38 (39): 2944–2947. doi:10.1093/eurheartj/ehx300. PMID 28637251. ^ Gyöngyösi, Mariann; Lukovic, Dominika; Zlabinger, Katrin; Mandic, Ljubica; Winkler, Johannes; Gugerell, Alfred (1 January 2017). "Cardiac Stem Cell-based Regenerative Therapy for the Ischemic Injured Heart — a Short Update 2017". Journal of Cardiovascular Emergencies. 3 (2): 81–83. doi:10.1515/jce-2017-0009. ISSN 2457-5518. ^ Giarratana MC, Kobari L, Lapillonne H, et al. (January 2005). "Ex vivo generation of fully mature human red blood cells from hematopoietic stem cells". Nat. Biotechnol. 23 (1): 69–74. doi:10.1038/nbt1047. PMID 15619619. ^ Archer, Graeme. "Technology". The Daily Telegraph. London. Retrieved 24 May 2010. ^ Anglin, Ian (26 August 2013). "Scientists Grow Teeth Using Stem Cells". SingularityHUB. Retrieved 31 July 2014. ^ Yen AH, Sharpe PT (January 2008). "Stem cells and tooth tissue engineering". Cell Tissue Res. 331 (1): 359–72. doi:10.1007/s00441-007-0467-6. PMID 17938970. ^ Volponi AA, Pang Y, Sharpe PT (December 2010). "Stem cell-based biological tooth repair and regeneration". Trends in Cell Biology. 20 (12): 715–22. doi:10.1016/j.tcb.2010.09.012. PMC 3000521. PMID 21035344. ^ Saki N, Jalalifar MA, Soleimani M, Hajizamani S, Rahim F (2013). "Adverse Effect of High Glucose Concentration on Stem Cell Therap". Int J Hematol Oncol Stem Cell Res. 7 (3): 34–40. PMC 3913149. PMID 24505533. ^ Goldstein, Ron (2007). Embryonic stem cell research is necessary to find a diabetes cure. Greenhaven Press. p. 44. ^ a b Berebichez-Fridman, R.; Gómez-García, R.; Granados-Montiel, J.; Berebichez-Fastlicht, E.; Olivos-Meza, A.; Granados, J.; Velasquillo, C.; Ibarra, C. (2017). "The Holy Grail of Orthopedic Surgery: Mesenchymal Stem Cells—Their Current Uses and Potential Applications". Stem Cells International. 2017: 1–14. doi:10.1155/2017/2638305. PMC 5494105. PMID 28698718. ^ a b c Gurtner GC, Callaghan MJ, Longaker MT (2007). "Progress and potential for regenerative medicine". Annu. Rev. Med. 58 (1): 299–312. doi:10.1146/annurev.med.58.082405.095329. PMID 17076602. ^ Rognoni, Emanuel; Watt, Fiona M. (2018). "Skin cell heterogeneity in development, wound healing, and cancer". Trends in Cell Biology. 28 (9): 709–722. doi:10.1016/j.tcb.2018.05.002. ISSN 0962-8924. PMC 6098245. PMID 29807713. ^ Richards M, Fong CY, Bongso A (December 2008). "Comparative evaluation of different in vitro systems that stimulate germ cell differentiation in human embryonic stem cells". Fertil. Steril. 93 (3): 986–94. doi:10.1016/j.fertnstert.2008.10.030. PMID 19064262. ^ Ledford H (7 July 2009). "Sperm-like cells made from human embryonic stem cells". Nature News. doi:10.1038/news.2009.646. Archived from the original on 9 May 2011. ^ White, YAR; Woods DC; Takai Y; Ishihara O; Seki H; Tilly JL. (2012). "Oocyte formation by mitotically active germ cells purified from ovaries of reproductive-age women". Nature Medicine. 18 (3): 413–21. doi:10.1038/nm.2669. PMC 3296965. PMID 22366948. ^ Allers, Kristinia; Hütter, Gero; Hofmann, Jörg; Loddenkemper, Chrtoph; Rieger, Kathrin; Thiel, Eckhard; Schneider, Thomas (14 July 2014). "Evidence for the cure of HIV infection by CCR5Δ32/Δ32 stem cell transplantation". Blood. 117 (10): 2791–99. doi:10.1182/blood-2010-09-309591. PMID 21148083. ^ DiGiusto, David; Stan, Rodica; Krishnan, Amrita; Li, Haitang; Rossi, John; Zaia, John (22 November 2013). "Development of Hematopoietic Stem Cell Based Gene Therapy for HIV-1 Infection: Considerations for Proof of Concept Studies and Translation to Standard Medical Practice". Viruses. 2013 (5): 2898–919. doi:10.3390/v5112898. PMC 3856421. PMID 24284880. ^ Richardson LE, Dudhia J, Clegg PD, Smith R (September 2007). "Stem cells in veterinary medicine – attempts at regenerating equine tendon after injury". Trends Biotechnol. 25 (9): 409–16. doi:10.1016/j.tibtech.2007.07.009. PMID 17692415. ^ Csaki C, Matis U, Mobasheri A, Ye H, Shakibaei M (December 2007). "Chondrogenesis, osteogenesis and adipogenesis of canine mesenchymal stem cells: a biochemical, morphological and ultrastructural study". Histochem. Cell Biol. 128 (6): 507–20. doi:10.1007/s00418-007-0337-z. PMID 17922135. ^ a b c d Kane, Ed (May 2008). Stem-cell therapy shows promise for soft-tissue injury, disease. DVM Newsmagazine. 6E-10E. ^ a b c d Yamada Y, Ueda M, Naiki T, Takahashi M, Hata K, Nagasaka T (2004). "Autogenous injectable bone for regeneration with mesenchymal stem cells and platelet-rich plasma: tissue-engineered bone regeneration". Tissue Eng. 10 (5–6): 955–64. doi:10.1089/1076327041348284. PMID 15265313. ^ Singec I, Jandial R, Crain A, Nikkhah G, Snyder EY (2007). "The leading edge of stem cell therapeutics". Annu. Rev. Med. 58 (1): 313–28. doi:10.1146/annurev.med.58.070605.115252. PMID 17100553. ^ a b c d Zachos TA, Smith TJ (September 2008). Use of adult stem cells in clinical orthopedics. DVM Newsmagazine. 36–39. ^ a b c d e f Brehm W, Burk J, Delling U, Gittel C, Ribitsch I (2012). "Stem cell-based tissue engineering in veterinary orthopaedics". Cell Tissue Res. 347 (3): 677–88. doi:10.1007/s00441-011-1316-1. PMID 22287044. ^ a b c Gattegno-Ho D, Argyle SA, Argyle DJ (2012). "Stem cells and veterinary medicine: tools to understand diseases and enable tissue regeneration and drug discovery". Vet. J. 191 (1): 19–27. doi:10.1016/j.tvjl.2011.08.007. PMID 21958722. ^ I. Dobrinski; A.J. Travis (2007). "Germ cell transplantation for the propagation of companion animals, non-domestic and endangered species". Reproduction, Fertility, and Development. 19 (6): 732–39. doi:10.1071/RD07036. ^ a b Awad HA, Butler DL, Boivin GP, et al. (June 1999). "Autologous mesenchymal stem cell-mediated repair of tendon". Tissue Eng. 5 (3): 267–77. doi:10.1089/ten.1999.5.267. PMID 10434073. ^ Nathan S, Das De S, Thambyah A, Fen C, Goh J, Lee EH (August 2003). "Cell-based therapy in the repair of osteochondral defects: a novel use for adipose tissue". Tissue Eng. 9 (4): 733–44. doi:10.1089/107632703768247412. PMID 13678450. ^ Fraser JK, Wulur I, Alfonso Z, Hedrick MH (April 2006). "Fat tissue: an underappreciated source of stem cells for biotechnology". Trends Biotechnol. 24 (4): 150–54. doi:10.1016/j.tibtech.2006.01.010. PMID 16488036. ^ a b Park BW, Kang DH, Kang EJ, Byun JH, Lee JS, Maeng GH, Rho GJ (2012). "Peripheral nerve regeneration using autologous porcine skin-derived mesenchymal stem cells". J Tissue Eng Regen Med. 6 (2): 113–24. doi:10.1002/term.404. PMID 21337707. ^ a b Marfe G, Massaro-Giordano M, Ranalli M, Cozzoli E, Di Stefano C, Malafoglia V, Polettini M, Gambacurta A (2012). "Blood derived stem cells: an ameliorative therapy in veterinary ophthalmology". J. Cell. Physiol. 227 (3): 1250–56. doi:10.1002/jcp.22953. PMID 21792938. ^ Mlsna, Lucas J. (2010). "Stem Cell Based Treatments and Novel Considerations for Conscience Clause Legislation". Indiana Health Law Review. United States. 8 (2): 471–96. ISSN 1549-3199. OCLC 54703225. .
^ O'Connell, Claire (27 January 2012). "Stem cells – where are we now?". The Irish Times. ^ "BioTime acquires stem cell assets from Geron, raises $10 million". San Francisco Business Times. 7 January 2013. ^ François M, Copland IB, Yuan S, Romieu-Mourez R, Waller EK, Galipeau J (February 2012). "Cryopreserved mesenchymal stromal cells display impaired immunosuppressive properties as a result of heat-shock response and impaired interferon-γ licensing". Cytotherapy. 14 (2): 147–52. doi:10.3109/14653249.2011.623691. PMC 3279133. PMID 22029655. ^ Assmus B, Schächinger V, Teupe C, et al. (December 2002). "Transplantation of Progenitor Cells and Regeneration Enhancement in Acute Myocardial Infarction (TOPCARE-AMI)". Circulation. 106 (24): 3009–17. doi:10.1161/01.CIR.0000043246.74879.CD. PMID 12473544. ^ Murphy JM, Fink DJ, Hunziker EB, Barry FP (December 2003). "Stem cell therapy in a caprine model of osteoarthritis". Arthritis Rheum. 48 (12): 3464–74. doi:10.1002/art.11365. PMID 14673997. ^ Sampaolesi M, Blot S, D'Antona G, et al. (November 2006). "Mesoangioblast stem cells ameliorate muscle function in dystrophic dogs". Nature. 444 (7119): 574–79. doi:10.1038/nature05282. PMID 17108972. ^ Taylor SE, Smith RK, Clegg PD (March 2007). "Mesenchymal stem cell therapy in equine musculoskeletal disease: scientific fact or clinical fiction?". Equine Vet. J. 39 (2): 172–80. doi:10.2746/042516407X180868. PMID 17378447. ^ Tecirlioglu RT, Trounson AO (2007). "Embryonic stem cells in companion animals (horses, dogs and cats): present status and future prospects". Reprod. Fertil. Dev. 19 (6): 740–47. doi:10.1071/RD07039. PMID 17714628. ^ Koch TG, Betts DH (November 2007). "Stem cell therapy for joint problems using the horse as a clinically relevant animal model". Expert Opin Biol Ther. 7 (11): 1621–26. doi:10.1517/14712598.7.11.1621. PMID 17961087. ^ Young RG, Butler DL, Weber W, Caplan AI, Gordon SL, Fink DJ (July 1998). "Use of mesenchymal stem cells in a collagen matrix for Achilles tendon repair". J. Orthop. Res. 16 (4): 406–13. doi:10.1002/jor.1100160403. PMID 9747780. ^ Bruder SP, Kraus KH, Goldberg VM, Kadiyala S (July 1998). "The effect of implants loaded with autologous mesenchymal stem cells on the healing of canine segmental bone defects". J Bone Joint Surg Am. 80 (7): 985–96. doi:10.2106/00004623-199807000-00007. PMID 9698003. Archived from the original on 28 July 2012. ^ Kraus KH, Kirker-Head C (April 2006). "Mesenchymal stem cells and bone regeneration". Vet Surg. 35 (3): 232–42. doi:10.1111/j.1532-950X.2006.00142.x. PMID 16635002. ^ a b c Ribitsch I, Burk J, Delling U, Geißler C, Gittel C, Jülke H, Brehm W (2010). Basic Science and Clinical Application of Stem Cells in Veterinary Medicine. Bioreactor Systems for Tissue Engineering II. 123. pp. 219–63. doi:10.1007/10_2010_66. ISBN 978-3-642-16050-9. PMID 20309674. ^ Black LL, Gaynor J, Adams C, et al. (2008). "Effect of intraarticular injection of autologous adipose-derived mesenchymal stem and regenerative cells on clinical signs of chronic osteoarthritis of the elbow joint in dogs". Vet. Ther. 9 (3): 192–200. PMID 19003780. ^ Nixon AJ, Dahlgren LA, Haupt JL, Yeager AE, Ward DL (July 2008). "Effect of adipose-derived nucleated cell fractions on tendon repair in horses with collagenase-induced tendinitis". Am. J. Vet. Res. 69 (7): 928–37. doi:10.2460/ajvr.69.7.928. PMID 18593247. ^ Guercio A, Di Marco P, Casella S, Cannella V, Russotto L, Purpari G, Di Bella S, Piccione G (2012). "Production of canine mesenchymal stem cells from adipose tissue and their application in dogs with chronic osteoarthritis of the humeroradial joints". Cell Biol. Int. 36 (2): 189–94. doi:10.1042/CBI20110304. PMID 21936851. ^ Kim U, Shin DG, Park JS, Kim YJ, Park SI, Moon YM, Jeong KS (2011). "Homing of adipose-derived stem cells to radiofrequency catheter ablated canine atrium and differentiation into cardiomyocyte-like cells". Int. J. Cardiol. 146 (3): 371–78. doi:10.1016/j.ijcard.2009.07.016. PMID 19683815. ^ Chang Y, Lai PH, Wei HJ, Lin WW, Chen CH, Hwang SM, Chen SC, Sung HW (2007). "Tissue regeneration observed in a basic fibroblast growth factor–loaded porous acellular bovine pericardium populated with mesenchymal stem cells". The Journal of Thoracic and Cardiovascular Surgery. 134 (1): 65–73.e4. doi:10.1016/j.jtcvs.2007.02.019. ISSN 0022-5223. PMID 17599488. ^ Sung Su Park; et al. (2012). "Functional recovery after spinal cord injury in dogs treated with a combination of Matrigel and neural-induced adipose-derived mesenchymal Stem cells". Cytotherapy. 14 (5): 584–97. doi:10.3109/14653249.2012.658913. PMID 22348702. ^ Ryu HH, Lim JH, Byeon YE, Park JR, Seo MS, Lee YW, Kim WH, Kang KS, Kweon OK (2009). "Functional recovery and neural differentiation after transplantation of allogenic adipose-derived stem cells in a canine model of acute spinal cord injury". J. Vet. Sci. 10 (4): 273–84. doi:10.4142/jvs.2009.10.4.273. PMC 2807262. PMID 19934591. ^ Nishida H, Nakayama M, Tanaka H, Kitamura M, Hatoya S, Sugiura K, Harada Y, Suzuki Y, Ide C, Inaba T (2012). "Safety of Autologous Bone Marrow Stromal Cell Transplantation in Dogs with Acute Spinal Cord Injury". Veterinary Surgery. 41 (4): 437–42. doi:10.1111/j.1532-950X.2011.00959.x. ISSN 0161-3499. PMID 22548465. ^ Enserink, M (14 July 2006). "Biomedicine. Selling the stem cell dream". Science. 313 (5784): 160–3. doi:10.1126/science.313.5784.160. PMID 16840673. ^ a b Sipp, D (2017). "The malignant niche: safe spaces for toxic stem cell marketing". NPJ Regenerative Medicine. 2: 33. doi:10.1038/s41536-017-0036-x. PMC 5736713. PMID 29302366. ^ a b Slabbert, Melodie (21 August 2015). "South Africa's struggle to control sham stem cell treatments". The Conversation. ^ "FDA presses its campaign against rogue regenerative med players, cites StemGenex for illegal sales". Endpoints News. 14 November 2018. ^ Colleen Tressler (18 October 2018). "FTC takes aim at deceptive stem cell therapy claims". US Federal Trade Commission. Retrieved 7 March 2019.